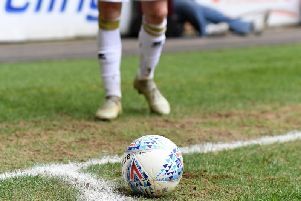 One was outside the penalty area and one wasn’t even a foul, but two penalties sandwiched a Josh Murphy strike as MK Dons brushed aside Northampton 3-0 in the FA Cup on Tuesday night. Ben Reeves and Simon Church both converted from 12 yards in the second half at stadium:mk as Dons set up a mouth-watering clash with Chelsea in the next round. Josh Murphy made it 2-0 shortly after coming on. Looked decidedly dodgy at the time, manager Karl Robinson admitted afterwards his side had Lady Luck on their side. Regardless of the decisions though, Dons had more than enough in their locker to see off the spirited League 2 outfit from 25 miles up the road. A goal-less first half merely delayed the onslaught. Well in control, Dons penned Cobblers into their own half for long periods without really testing keeper Adam Smith, simply leaning on the bright pink defence, poking and probing. Simon Church converts his penalty to make it 3-0. Two spanners were thrown in the works for Dons though. Nicky Maynard’s hamstring said ‘no more’ prior to kick off making him a major doubt for the massive game against Bolton on Saturday. And Matt Upson’s troubled Dons career took what could be the final blow as he was replaced after 38 minutes with yet another injury set-back. With the prize at the end of the game so significant, neither side really took the right risks to open the scoring, but the second half, or at least the opening 16 minutes of it, would ensure Dons safe passage into the next round. While Northampton thought they’d scored when David Martin caught the ball but was barrelled over his line by a Northampton shove, Dons went up the other end to win the first of their dubious penalties on 52 minutes. Dean Bowditch squared up Zander Diamond before cutting onto his right foot, beating the defender but getting tripped. Over he went, outside the box it appeared, but a penalty was awarded. Reeves made no mistakes. Unable to shake off the knock, Bowditch was replaced by Josh Murphy and the substitute’s impact was almost immediate. He hit the bar with his first contribution, before springing the offside trap on the hour, outfoxing Smith with the eyes before slotting away Dons’ second. There was no way back for Northampton after that, as Dons dropped the tempo, inviting the pressure while limiting the visitors to pot-shots from range as the 7,000 travelling Town supporters started to lose their gusto. The final nail in the Cobblers coffin came in the last minute. Smith appeared to make a great stop from the ever-threatening Rob Hall, but referee Tony Harrington pointed to the spot. Simon Church - Maynard’s 11th hour replacement - did the business to put the icing on the cake.